 Wed Jun 08 2011 22:34:58 GMT-0500 (CST). 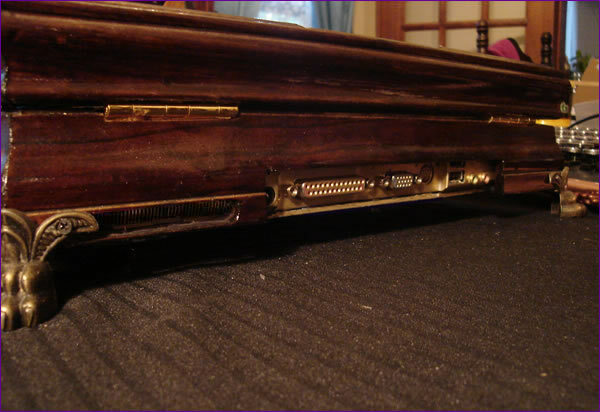 This may look like a Victorian music box, but inside this intricately hand-crafted wooden case lives a Hewlett-Packard ZT1000 laptop that runs both Windows XP and Ubuntu Linux. 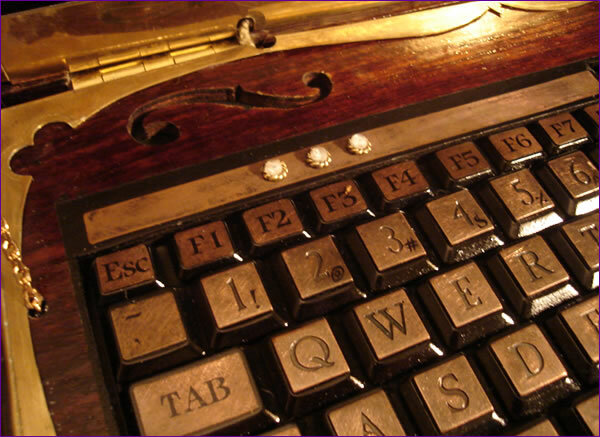 It features an elaborate display of clockworks under glass, engraved brass accents, claw feet, an antiqued copper keyboard and mouse, leather wrist pads, and customized wireless network card. 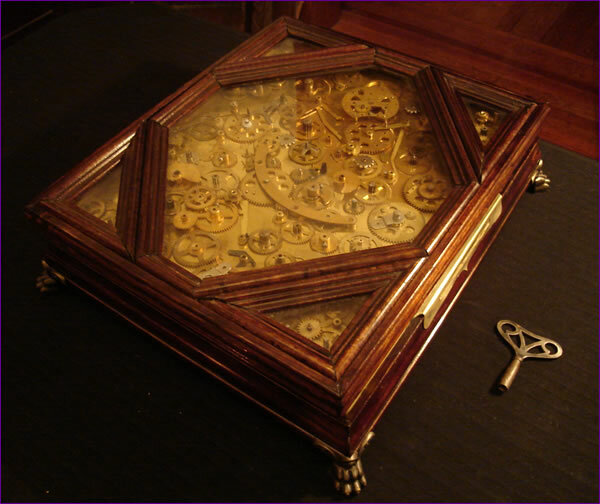 The machine turns on with an antique clock-winding key by way of a custom-built ratcheting switch made from old clock parts. This particular laptop is not for sale, but feel free to join the mailing list because I do plan to build some more in the future, and possibly some smaller netbook versions using a Lenovo Netbook or similar. 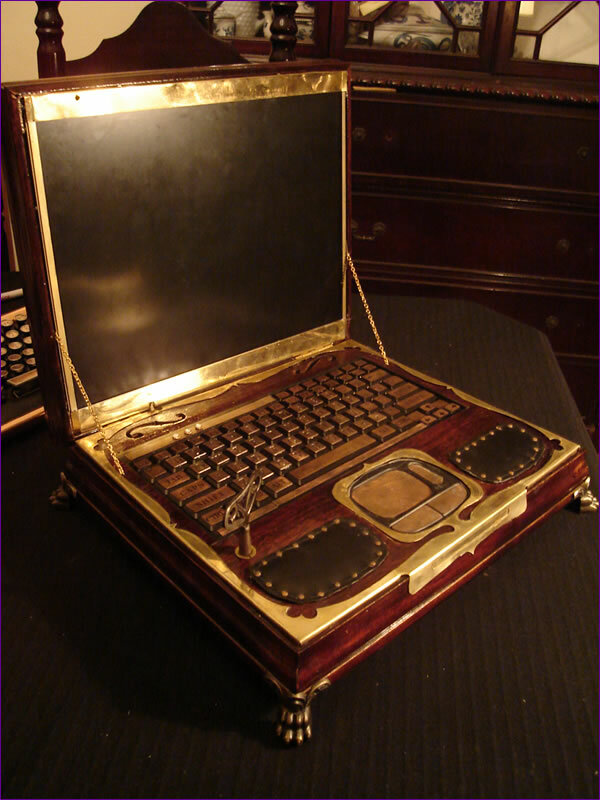 This laptop was featured in a gallery of steampunk creations on Newsweek.com! The violin-style sound holes, or "F-holes" are functional speaker grills covered with black cloth. For a little added redundancy, the original power switch is accessible through the speaker fabric. If you need to do a hard reboot, you can take a pen or pencil and press down on the fabric in the dead-center of the leftmost lobe of the f-hole to contact the button. The original keyboard LEDs now shine through small plastic gems. 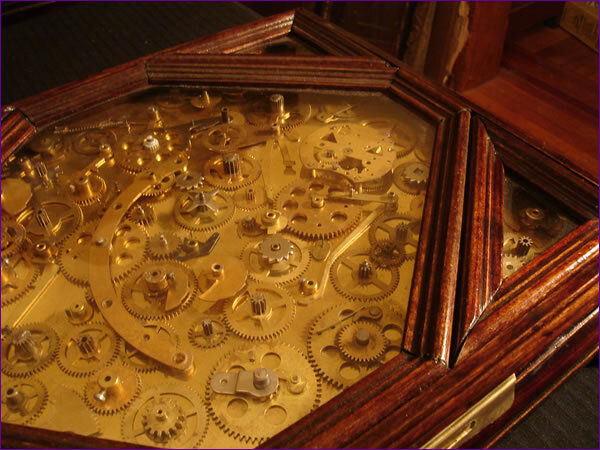 Here's a video of both the clock-winding key and the hidden power switch in action. 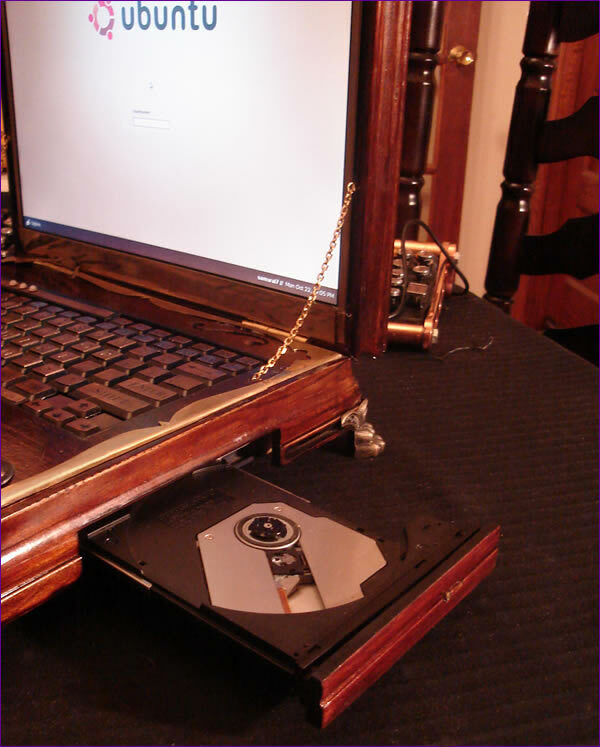 The DVD-ROM opens by pressing a small, round, brass button. 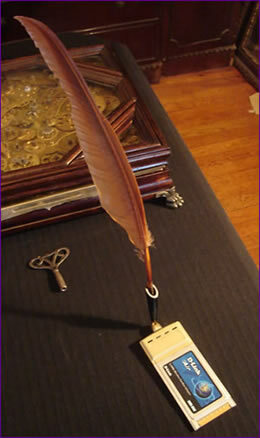 Here is an accessory that I am going to add to the laptop once I cut the PCMCIA door into the side. 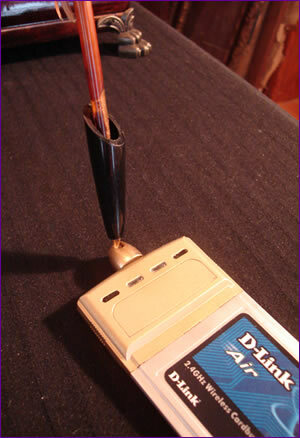 I have added a pen holder and a ball-point quill pen to a standard D-Link WiFi card. This pen can double as a stylus for use on the touch pad (or for a future Wacom tablet mod....hmmmmm..the contraptionist hairs on my neck are standing on end). 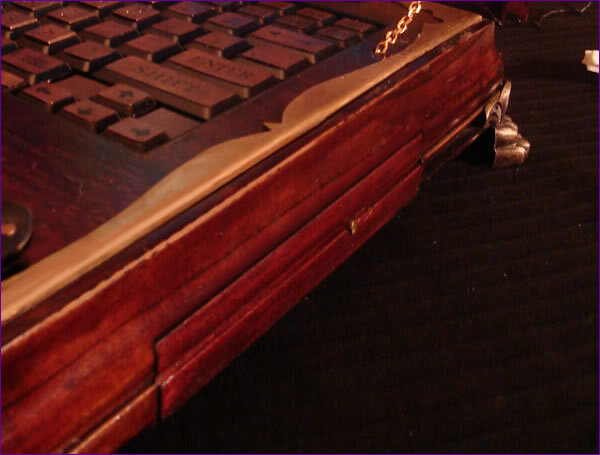 I also plan to eventually add a small wooden drawer that fits into the empty PCMCIA slot that will hold the clock-winding key when not in use. 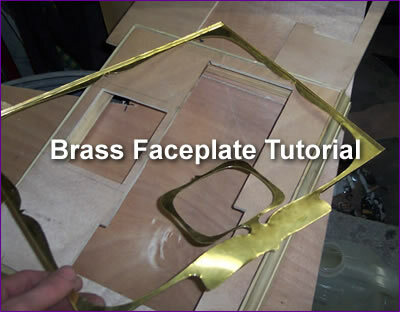 For all you aspiring tinkerers out there, I've composed a short tutorial on how you can create brass borders of your own without the need for expensive metalworking tools. 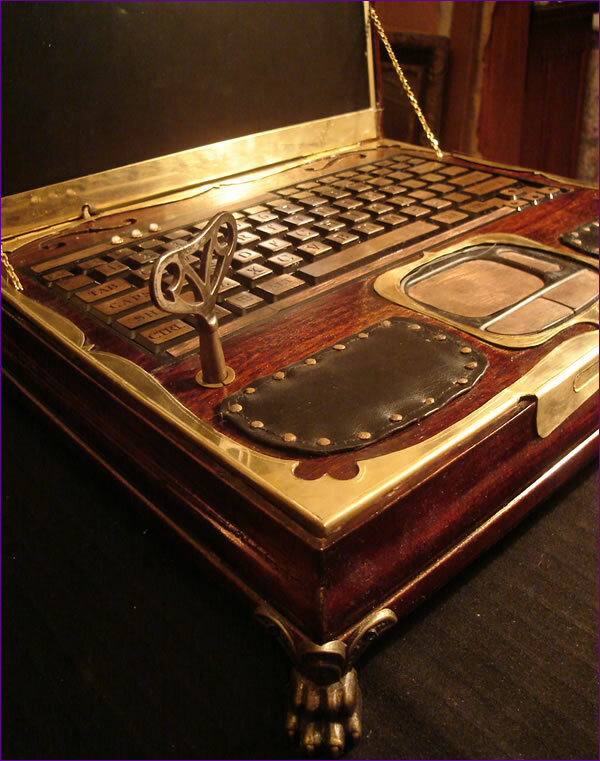 If you are interesting in seeing the creative process behind the laptop, you can also check out this thread at the Brass Goggles Steampunk Forum which grew into a sort of 'build log' for the project. Ignore the original stated timeline for the project. I delayed the publishing of it for quite a while. Sign up to the Mailing List to stay informed of project updates, art pieces for sale, and occasional pointless ramblings from Datamancer himself! Noncommercial users are welcome to copy my images provided they acknowledge the source. I am more than happy to help people design or create their own steampunk contraptions, but if you are a company looking to steal my work for mass-production, please know that I have design patents, trademarks, and copyrights pending or in place on most of my designs, my logo, and my name. They will be brutally enforced if necessary.